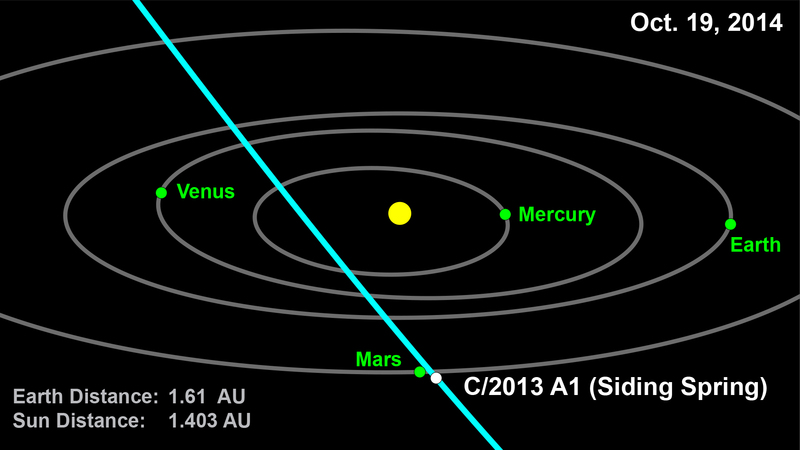 Comet 2013 A1 (Siding Spring) will make a very close approach to Mars in October 2014. The latest trajectory of comet 2013 A1 (Siding Spring) generated by the Near-Earth Object Program Office at NASA’s Jet Propulsion Laboratory in Pasadena, Calif., indicates the comet will pass within 186,000 miles (300,000 kilometers) of Mars and there is a strong possibility that it might pass much closer. The NEO Program Office’s current estimate based on observations through March 1, 2013, has it passing about 31,000 miles (50,000 kilometers) from the Red Planet’s surface. That distance is about two-and-a-half times that of the orbit of outermost moon, Deimos. Rob McNaught discovered comet 2013 A1 Siding Spring on Jan. 3, 2013, at Siding Spring Observatory in Australia. A study of germane archival observations has unearthed more images of the comet, extending the observation interval back to Oct. 4, 2012. Read more: NASA – Comet to Make Close Flyby of Red Planet in October 2014.